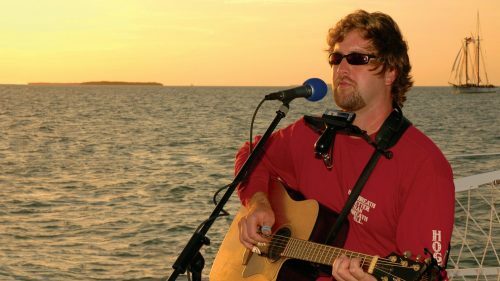 Looking for an authentic Key West experience? Then, take your seat aboard Fury’s Island Adventure. 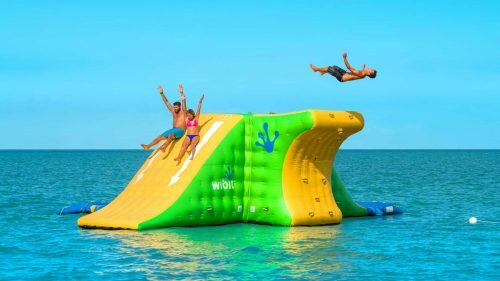 You’ll spend the day like a local, kicking back, enjoying laidback fun in the sun and the amazing eco-wonders of Key West’s backcountry. The adventure begins the moment you step onto our custom-built spacious power catamaran. 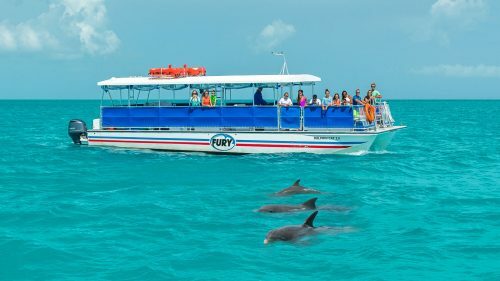 Designed just for this special trip, its unique construction allows us to cruise to the calm and shallow waters of the Florida Keys backcountry quickly and comfortably. 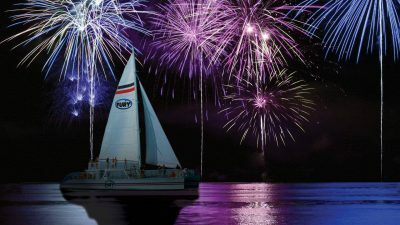 Indulge in a light, complimentary breakfast as the boat leaves the dock on its way to Key West’s backcountry. 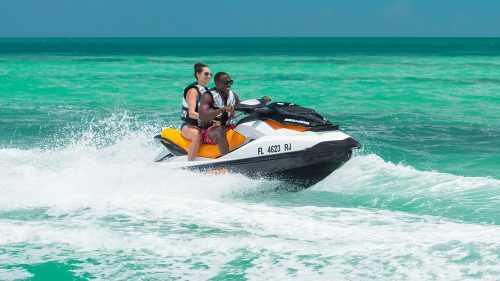 We’ll travel through Key West’s lake passage, surrounded by lush mangrove islands that create a smooth and scenic ride. We’ll wind between these tropical keys, the ones that only locals know about. Each day and each trip is a different experience—it all depends on which way the tide is rolling …just like the locals; we take it as it comes and always enjoy the ride. As you explore the eco-wonders on the surface, don’t forget that there’s a whole other world beckoning below the waterline. 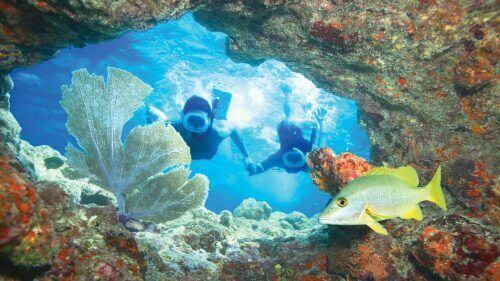 These shallows offer translucent waters and soft sandy bottoms where spiny sea urchins mingle with conch shells and sea sponges. Don’t be surprised if some of the decidedly larger marine life make an appearance like the Goliath grouper, stingrays, and several tropical fish species. Along the way, our onboard naturalists will share their knowledge of the area and its indigenous wildlife with you. 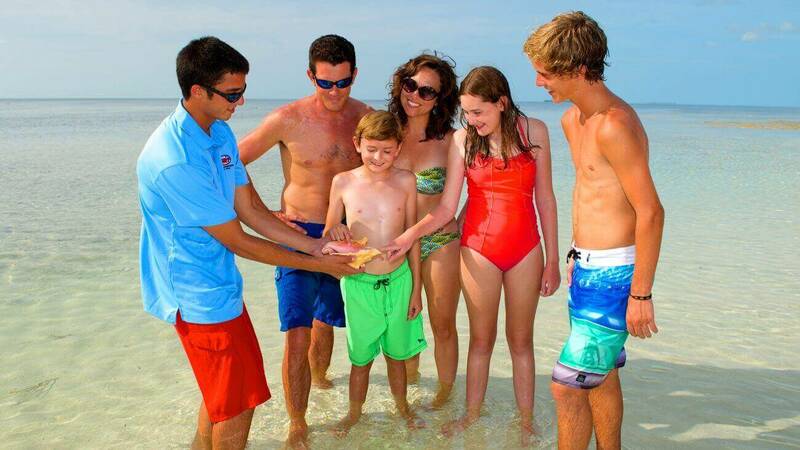 Be sure to be on the lookout for our most playful residents, the friendly bottlenose dolphins and curious sea turtles. 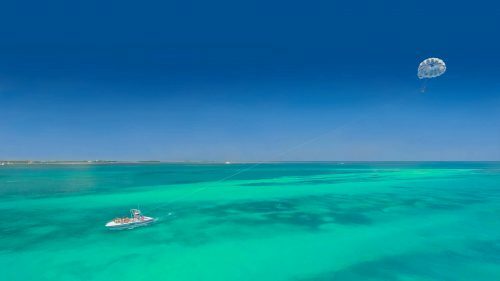 Enjoy a delicious lunch as we make our way to a remote natural sandbar where you can sink your toes into the warm sand of the shallow waters, sip a frosty beverage or enjoy some exciting water activities! 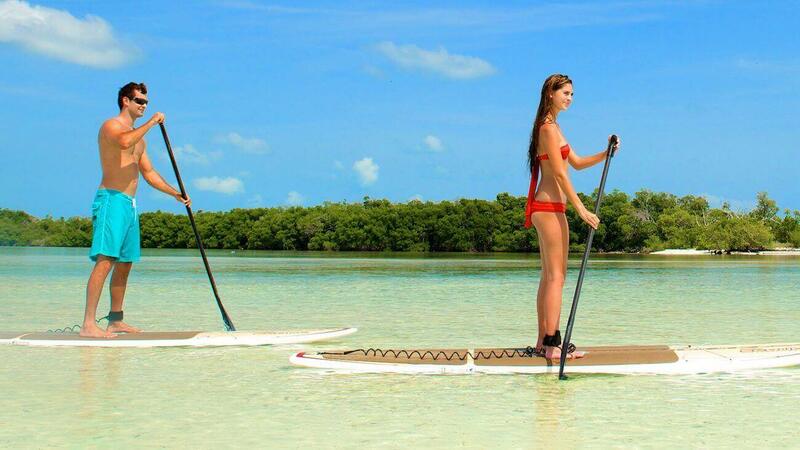 Grab a kayak and explore the clear waters on a guided tour through the Key West mangroves. 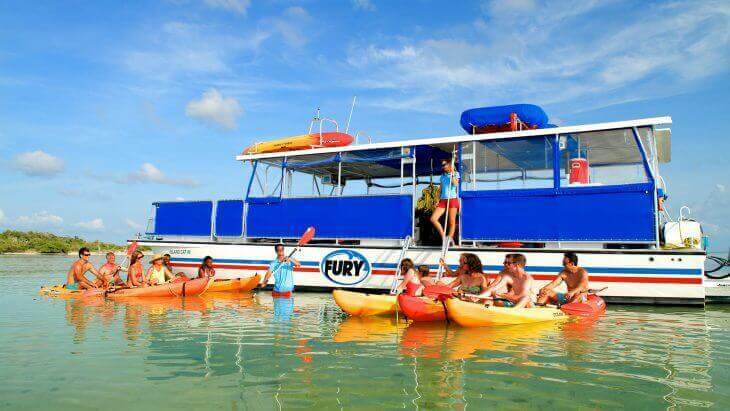 If you’ve never kayaked before, the Fury crew will provide instruction that will have you enjoying an easy paddle on one of our sea kayaks in no time. 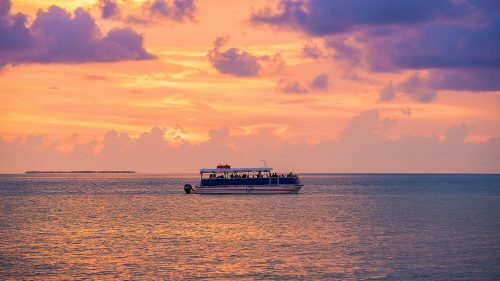 Along the way, you’ll be awed by the stunning natural beauty of this secluded part of the Florida Keys. 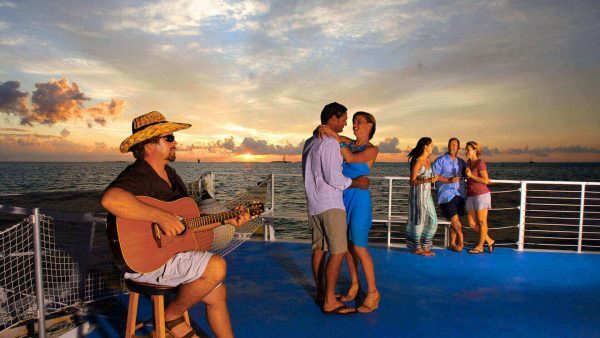 Come join us and unwind, our Island Adventure will transport you to a Key West state of mind. 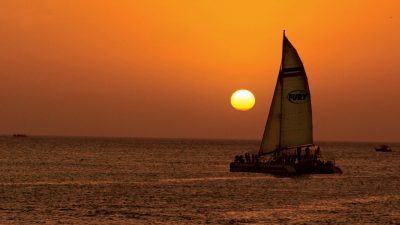 The exact way points of each trip are at the captain’s discretion and subject to change due to tides and weather. Children 15 years old and younger must be accompanied by an adult. 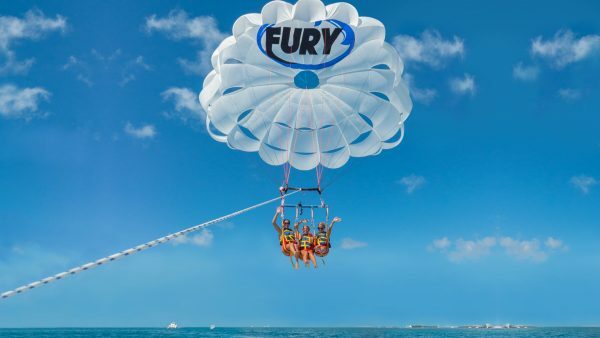 Children 16-18 may go on a Fury Island Adventure unaccompanied, but only if they have a valid photo ID. 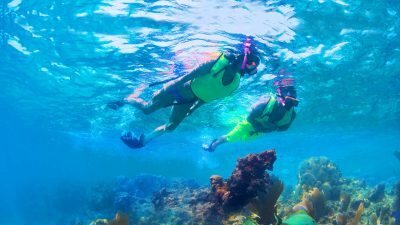 Yes, mask, snorkel, fins and buoyancy compensator vests are provided, but guests may bring their own gear if they would like. We serve Assorted Croissants & Danishes, Fresh Fruit and Fresh Granola for breakfast and rolls, turkey & ham, sliced cheddar & swiss cheeses, lettuce, tomato & onion, mayo & mustard for sandwiches, fresh Vegetable platter with hummus & ranch and homemade cookies for lunch. 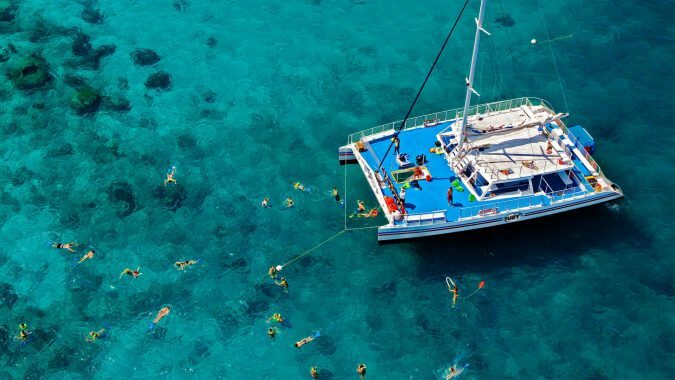 As soon as you are finished with snorkeling portion of the trip, you are more than welcome to have beer and wine. 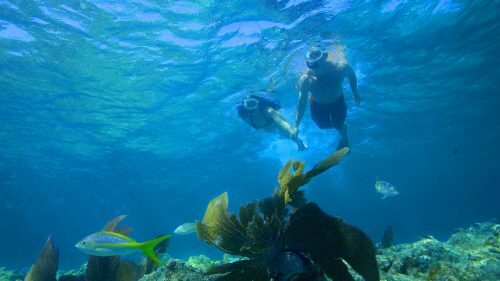 You will get about 45 minutes of snorkeling and about 1.5 hours for the kayak tour and sandbar/shallow water location relaxation time. How much time do you spend at the sandbar/shallow water location? You will get to enjoy the beautiful waters at the sandbar/shallow water location for about 1.5 hours. 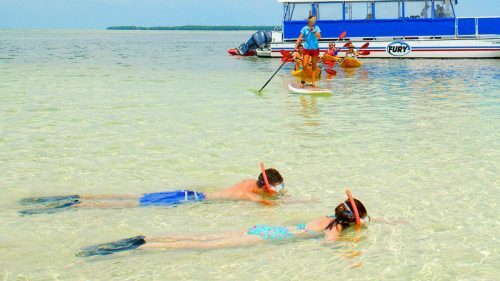 During this time you will also be able to enjoy a guided kayak tour of a nearby mangrove island. Yes! 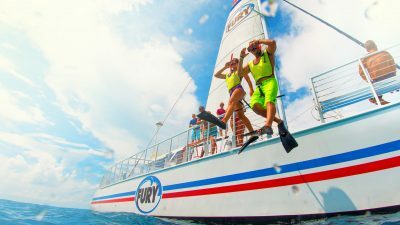 The Fury crew will explain to you what you will see while you are in the Florida Keys Sanctuary. 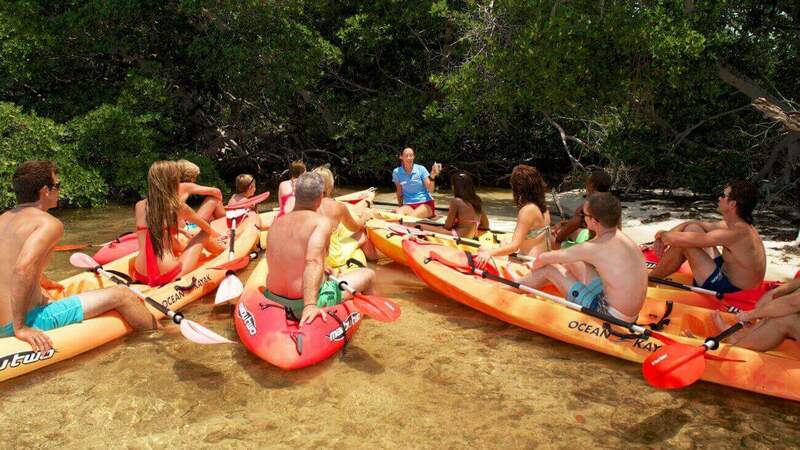 They will also guide you on the kayaking tour in and around the mangroves. Will you be taking us to an Island? We will be taking you to the backcountry which is located in the Gulf of Mexico. Here you will be able to relax in shallow waters and kayak in and around a small island of mangroves. Is this trip family friendly? 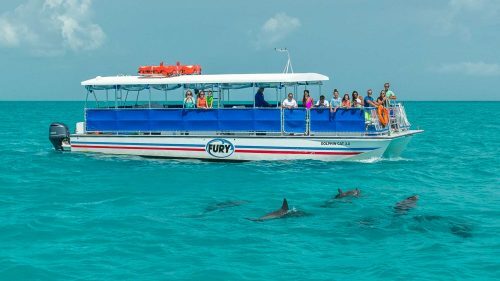 This trip is very family friendly and very relaxing for all ages. Are there places to get out of the sun? 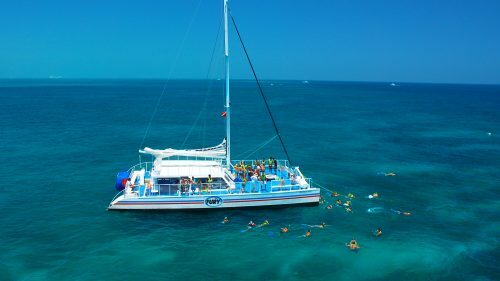 The power catamaran has a covered area that can accommodate our guests. This boat holds 30 people. 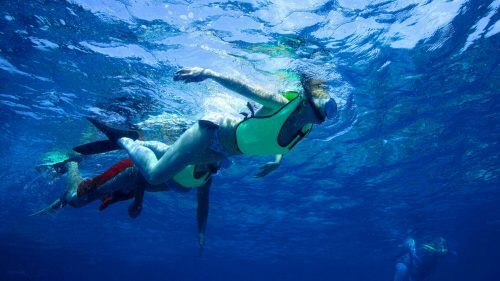 To truly enjoy your snorkeling experience you should at least feel comfortable being in open water. 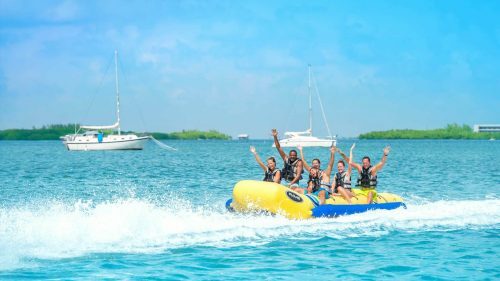 While we do offer flotation devices to assist our guests, we recommend that you be able to fully support yourself in 8-20 feet of open water. 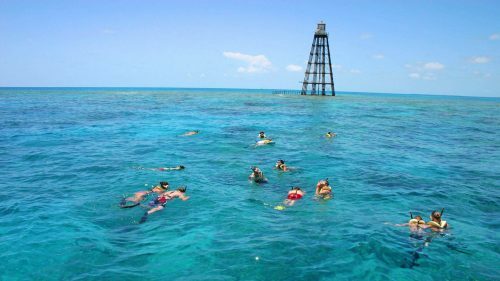 We take you about 7 miles off of Key West and there will not be a place for you to touch or stand while snorkeling the reef. 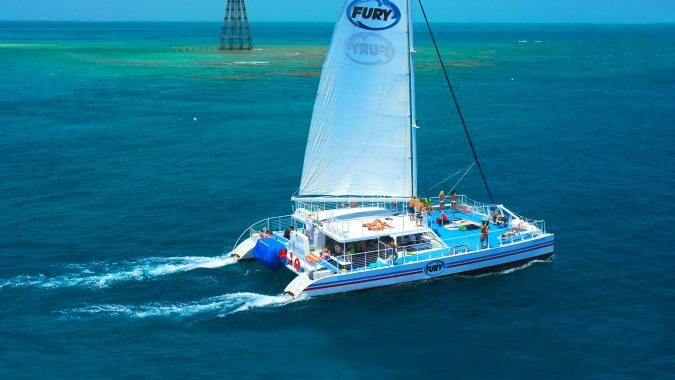 Fury crew is present in the water to assist in an emergency, but will not be able to solely attend to one party for the duration of the trip. 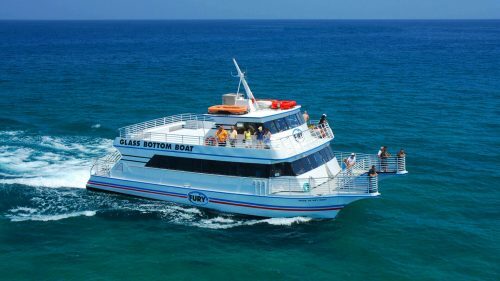 For those unable to support themselves, we suggest booking a trip aboard our glass bottom boat or joining us for parasailing.